This page is a collection of small COMMISSIONED projects, Re-scoring challenges, as well as the entries I have submitted in VARIOUS INTERNATIONAL COMPETITIONS SINCE 2010. This page is being updated (1/2/19) for content as I work backwards CHRONOLOGICALLY. this project has completed festival circuits and will be available in full shortly! My latest project completed October 1st is an eighteen minute short film by Zar productions. It is a halmark worthy story of love, family, and the decisions faced around the holidays. 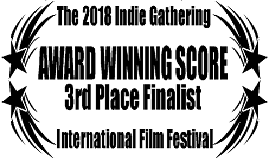 the film is currently submitted to festivals around the country already winning HONORABLE mention awards for original story as well as ensemble. below is a sneak peak of my score pulled from the scene that inspired me first. This entry was recently critiqued in competition and awarded a 3rd place win. It is my first ever top 10 placing in the Non-Horror category and I am very proud to be recognized! A classic western has so many opportunities for my large orchestra sound: Saloon fights, tragedy... physical comedy...This one had it all! tHIS VIDEO WAS COMMISSIONED AND OPEN FOR INTERNATIONAL SUBMISSIONS. iT IS AN ART PIECE ABOUT A DEVICE WHICH CAN BE PROGRAMMED TO DISPENSE PHYSICAL CASH AND ADJUSTED TO INCREASE OR DECREASE THE RATE IT IS DISTRIBUTED. iT WAS A FUN SMALL PROJECT WHERE THE DIRECTOR ASKED FOR AN "INDUSTRIAL BUT WHIMSICAL" SOUND. nOT SURE i QUITE HIT THE "INDUSTRIAL" MARK BUT I HAVE BEEN TOLD IT IS CATCHY AND LINGERS AFTER HEARING IT. 4. cHRISTOPHER LEE HORROR TRAILER. I really enjoyed this project! the challenge of matching period music to the a black and white film was a great opportunity to showcase my more traditional style and dedication to the orchestra. This submission received a 4th place win! This is part 1 of 3 in a series of challenges to re-score random existing materials presented to me by a Friend and COLLEaGuE at Zar Productions. This was an inspiring first challenge, because i feel I better captured the sense of "wonder" commanded in the performance of geoffrey rush. Disclaimer: EMOTIONS IMAGINED STUDIOS claims no ownership to the video content or materials presented here by National Geographic. The materials were used for educational purposes only as a teaching experience. This is Part 2 of 3 in a series of "re-score" challenges presented to me by ZAR Productions. The footage is from a game called Tunnel Rush. This was unique challenge in that there is no dialogue to work around, and the music is center stage. I really found myself challenged yet still found hit points to target musically. Disclaimer: EMOTIONS IMAGINED STUDIOS claims no ownership to the video content or materials presented here by Deer Cat. The materials were used for educational purposes only as a teaching experience. Part 1 of the The Indie Gathering 2017 competition, this was the Horror score portion that received my 3rd 4th place win in my history for the competition. In this entry there are many plot elements, from mysterious creatures to government conspiracy, a lot of different tones to capture and account for. Part 2 of the The Indie Gathering 2017 competition, this was the Action score portion. This placed "Honorable Mention" but was a unique project given its Heist plot. I particularly enjoyed the motif for the police and the chase as they tried to piece together the motives of the criminals.